They have voted in favour of action up to and including the complete withdrawal of labour. MIDWIVES IN THE Taoiseach’s hometown of Castlebar, Mayo, are to start industrial action due to staff shortages. The INMO members at Mayo University Hospital said they have voted in favour of action up to and including the complete withdrawal of labour. In a statement this evening, the nurses said there are severe staff shortages in the maternity ward which need to be addressed as soon as possible. Members said they would first perform a lunchtime protest on 5 December and then will implement a work-to-rule on 7 December, where “members will withdraw from clerical and support duties to focus on, and prioritise, direct midwifery care”. If no progress is made at that stage, the union said it will proceed “to a full withdrawal of labour”. Speaking today, INMO industrial relations officer, Anne Burke said:“Midwives are disillusioned with the HSE and its failure to listen and act in a timely fashion and put in place robust governance and safe staffing arrangements. Our members have nothing personally to gain by speaking out except securing a safe, quality and appropriately staffed maternity service for mothers and babies. Burke said that frontline midwives are very concerned about the ongoing clinical risks at the hospital, which the INMO claim have been left “unaddressed”. 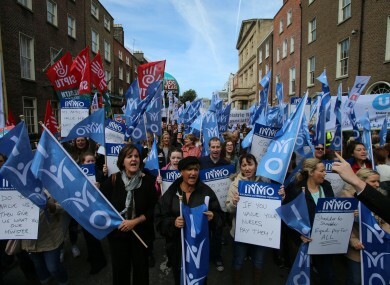 Earlier this month, the INMO called for an immediate discussion with the Government over pay and working conditions and balloted their members on the prospect of industrial action. This was in response to recommendations made by the Labour Court on garda pay. Minister for Health Simon Harris said at the time that he was “well aware of the challenges with recruiting staff nurses” and that his department was attempting to bring in as many new nurses as possible. Email “'Disillusioned and concerned': Midwives to start industrial action over staff shortages”. Feedback on “'Disillusioned and concerned': Midwives to start industrial action over staff shortages”.